"I am Proud to be a member of the London PA Network which captures, in my view, the very essence of Professional Secretaries, enabling them to meet regularly both socially and professionally, and helping each other with support and advice." Following a tour of the beautiful St Pancras Renaissance Hotel, we looked at the railway station itself. 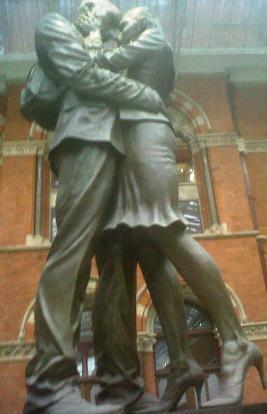 Although I have been to St Pancras International Station before, I did not even know the 9 metre high, 20-tonne bronze statue named “The Meeting Place” existed. It is incredible! 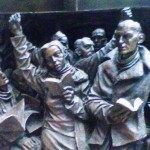 Not only has Paul Day, the artist, captured every muscle, stance and expression of the main statue beautifully, but there are scenes depicted around the base of the statue that are all about travel and show people in different situations, whether strap-hanging on the commuter line or standing in top hat and tails on an empty platform waiting for a train that you suspect will never arrive – in bronze! The perspective he has achieved on each of these scenes is incredible. A beautiful red-brick Victorian architecture, the Barlow Train Shed with its huge roof – 689 feet long, 240 feet across and 105 feet high; the 5 huge Olympic rings hanging from the ceiling as a constant reminder of the next huge event being staged in London, and the vast array of international shops, boutiques, cafes and bars. Did you know: the Barlow Train Shed, built in 1868, was built over the canal and rests on 850 pillars? The station reopened in 2007 after a 6-year, £800million redevelopment project, changing its name from St Pancras to St Pancras International, and is now part of the High Speed 1 (HS1) and the Channel Tunnel link, owned by HS1 Limited and operated by Network Rail. Coming up to the Olympics, security has increased many-fold and exercises are taking place every night in readiness as security, police, emergency services, army, UK Border Control etc. practice for the movement of thousands of people during Olympic time. The Eurostar Control Room itself, as you would expect, is surrounded by very tight security, and the Control Room is manned 24 hours a day even though the trains only run from 1730 to 2200 hours. Inside this small room, at the end of what seems like endless corridors, beats the heart of the operation. A huge screen shows the movement of the trains, each train depicted on screen by a coloured block; the colour coding shows the operator whether it is an empty train, whether it is carrying cargo or passengers, whether it is early, on time or late, at what stage of its journey it is at, and its estimated time of arrival and/or departure. There are three trains in platform at any one time. Another computer screen shows the log/table listing of where the trains are, and this has to be constantly manned and updated. A sign of the times we live in was brought home by the fact that a huge TV screen is situated on the wall in the corner of the room; it is always switched on, with the sound down but the subtitles running, because, as our guide told us, ‘if something happens in London such as a bomb going off or a riot starting up, it will be on the TV first and we need to be aware of what’s going on in case it comes our way’.